We are committed to serving merchants in many industries, whether you manage a start-up e-commerce website or a brick and mortar storefront. No matter your business needs, we will provide the right merchant credit card processing solution for you, including a secure payment gateway. Fill out the form, and our experts will work with you to find the credit card processing services that best match your business, implement solutions seamlessly into your existing business process and provide customer support 24 hours a day, 7 days a week. You’ll have all the products and resources to start saving money and achieve your business goals. 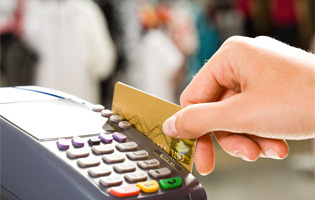 When your business accepts credit cards, compliance is a top priority and it’s a requirement. Credit card fraud and electronic theft are very real threats that can lead to devastating losses for both businesses and consumers. Our wide range of credit card processing solutions and security features comply with PCI DSS standards, this means that we maintain the highest standards of payment security in order to keep your business secure. Our advanced security solutions are designed to protect sensitive data for reduced risk of credit card fraud and drive increased customer confidence. You can count on us for the service, security and support you need to protect and expand your business. • Increase sales with our secure debit and credit card processing. • Manage your business with mobile and wireless account access and online billing. • Secure networks: PCI DSS compliant. We have payment processing solutions designed to meet your specific business needs, regardless of the industry your business serves. Our credit card processing solutions enable retail merchants to offer flexible payment methods at the point-of-sale, including all major credit cards, debit cards and checks. as well as advanced processing terminals. • Save money with our low processing rates and free terminal program. • Swipe credit cards securely with our PCI compliant payment solutions. We’ll improve your point-of-sale transactions while helping you increase retail sales by as much as 30%! We help you bring your business online, with secure e-commerce payment gateways that make accepting payments quick, safe and easy. • Increase your online sales by accepting credit cards, and other electronic payments on your website. • Simplify your customer experience in the checkout process by integrating with major shopping carts and providing lightning fast, secure transactions. • Comply with PCI DSS standards to protect online data.